I threw a lovely Brooklyn BBQ for some friends, and wanted to make some standards a little extra fancy! Here are some BBQ food ideas for your next party! I love throwing barbecues big and small in the summer! It’s a chance to try new things, new desserts, new drinks, new sides and some very tasty skewers! Here are a few ideas for your next BBQ! I like having a few treats set out for folks as they arrive. It can get pretty torturous standing beside the BBQ just waiting for the skewers to be done. I also don’t like to fire up the grill until everyone has arrived, so a simple cheese plate with olives, berries, chocolate and, of course, cheese is nice to snack on, and makes the party a little fancier. 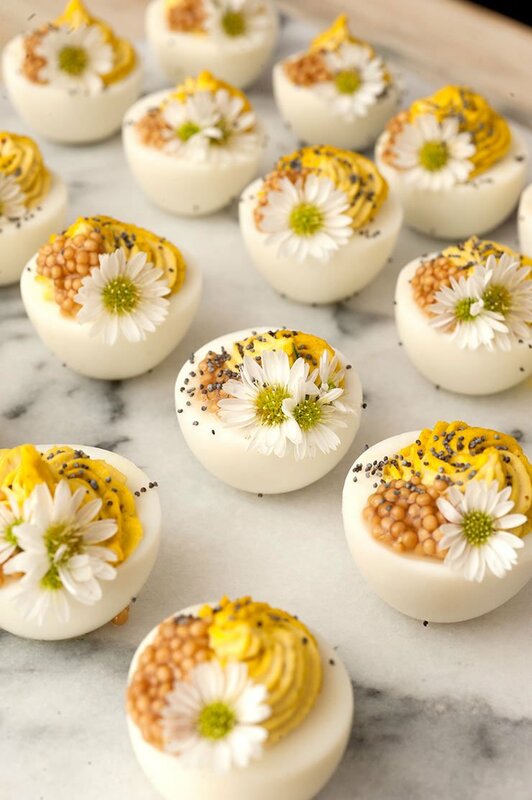 Deviled Eggs Are Nice, But Deviled Eggs With Daisies Are Nicer! My little two-tone daisy deviled eggs were such a hit! I use mayo, mustard and creamy horseradish for the filling, then I split it into two bowls and add curry to one of them. I separate the two flavors onto plastic wrap, roll them up, then fit them together in my pastry bag. Once I squeeze, I get the lovely little two toned egg! If you want to see exactly how, take a look! 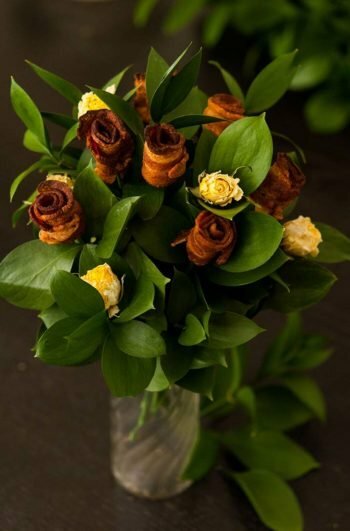 Why Not Make Treats Sunshine-Themed? It’s Summer! Time to celebrate the sun. 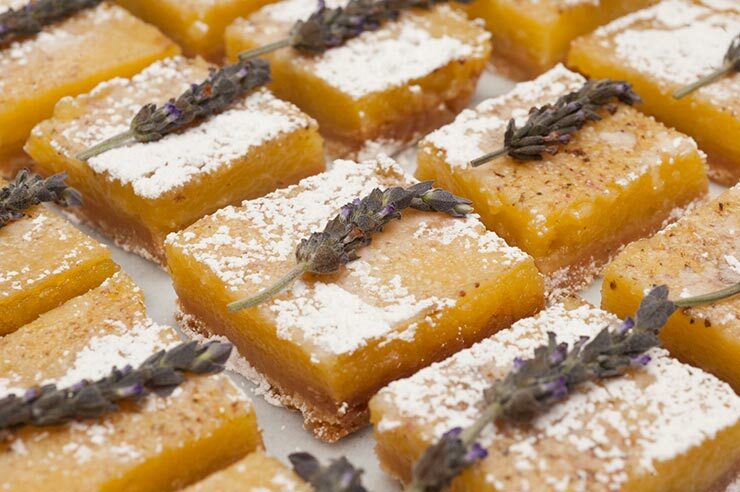 These Sunshine Lavender Lemon Bars are just like a burst of sunshine! I was afraid they’d be too rich for my guests, so I cut them into teeny tiny bars… little did I know, each guest ended up having about 4 each. They’re out of this world! Don’t Want Folks Eating Burgers Off of Laps? Make Skewers! They take a little more time to prepare, but if you don’t have a big picnic table where guests can sit and lift their burgers with both hands, make skewers! They’re easy enough to eat with 1 hand so they can be carried around on small plates. I made skewers with sausage, shrimp, mushrooms and onion with a soy sauce, mustard, Sriracha and garlic glaze. Add a Tasty (Easy to Make) Side! Dill potato salad is such a great side dish at a BBQ. I like using colorful little potatoes for my potato salads. It just looks more jolly that way. I also use radishes, celery and fresh dill. My potato salad mixture is so easy, and SO TASTY! Just a cup of mayo, 3 tablespoons of dill mustard, salt, pepper, a tablespoon of white balsamic vinegar and a half cup of fresh dill. Why make boring old corn on the cob when you can add butter, mayo, grated queso fresco and a spice blend of Cheyenne pepper, chili powder and smoked paprika? 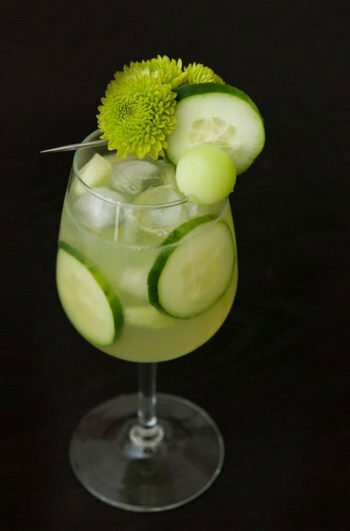 Include a Delicious, Easy to Make (and Affordable) Cocktail! Sangria is my BBQ cocktail of choice because I can make a bunch of it and not break the bank. Since it’s full of juice, it goes a longer way than a cocktail that’s only alcohol. 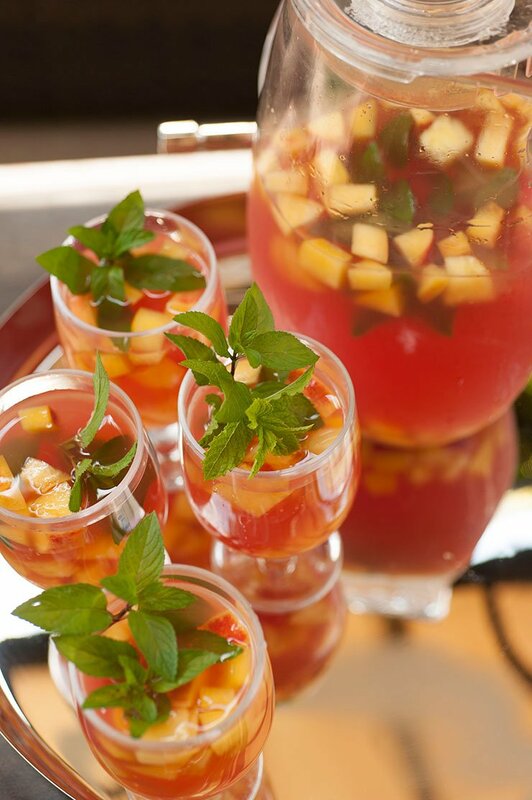 But be careful, cocktails like my Tropical Watermelon Sangria are deceptively dangerous. It’s so delicious and refreshing that you’d think you can drink glass after glass. Tiny sips are highly recommended. Oh, what a tasty day!